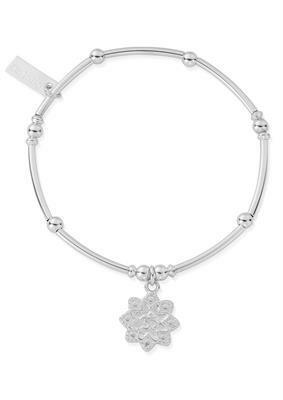 This ChloBo flower Om bracelet is made from 925 Sterling Silver. It features small silver noodles and beads surrounding a flower disc. In the middle of the flower, there is an Om symbol which symbolises serenity and calm. Add texture to your ChloBo bracelet stack with this stunning piece. ChloBo bracelets are elasticated to fit most wrists.